There are many ways from Europe to Africa – if you are a businessman or a tourist – but only a few routes back – if you only are on a pursuit for a better life. 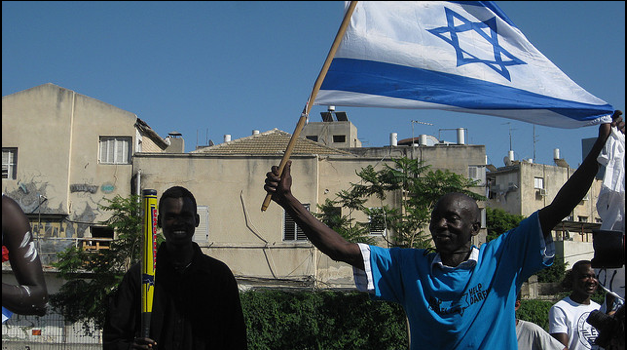 In Israel thousands immigrants are now facing eviction. As long as your journey is not officially acknowledged, you are treated as an “illegal immigrant” – and damned to choose between a small variety of dangerous, expensive and life threatening paths. The main migration routes from African countries to Europe are set by geography, weather and local political circmumstances along the way: Migrants from sub-saharan states for example either cross the desert and try to reach the Canary Islands by boat or try to cross the heavyly fortified border to spanish exclaves Ceuta or Melilla. Another route runs through Libya, where boats are heading across the mediterranian sea towards Lampedusa, Malta or even Sicily. A main route for migrants from east-african states like Eritrea follows the Nile through Egypt to go for a Sinai-crossing. The destination is Israel – a small, but wealthy state with a strong self-conception based on defence and immigration. The government of this country now has found a new way on how to treat immigrants, who have fled from Somalia, Ethiopia or Eritrea: According to media reports, Israel confirms plans to send thousands of “infiltrators” (as illegal immigrants are commonly referred to) to Uganda – in exchange for military assistance. The official plan is being sharply criticized by Civil Rights Activists in Israel, too. But in this case, Israel is only an example: The whole idea shows the helplessness of the so called “first world” democracies to cope with the phenomena of attraction that originate in achievements like basic human rights, wealth, freedom from repression and the chances of a better life in peace. “Uganda named as country to absorb African migrants from Israel“: The “Jerusalem Post” has it for free.